Please note that this item is an import and therefore may arrive slightly later than the anticipated release date Triple washed 100% cotton designed and constructed in LA by UNIF. 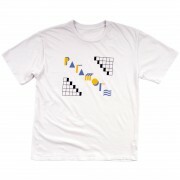 T-Shirt is unisex but run in US mens sizing. 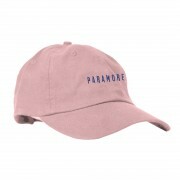 The Paramore ‘Tilted Logo’ Cap here features the band name embroidered on a pink adjustable cap. The Paramore ‘Hard Times’ T-Shirt here features the “Hard Times” song title and the band name printed in red on a white t-shirt. The t-shirt has red ringers around the neck and arms.